As regards the teacher, any planning time involved in this type of ‘lesson’ takes the form of eliminating any barriers to flow. That is, the project is as set up as possible, making sure that photos, footage and clips are already sourced and loaded into recognisable categories and folders and that their “multimodal mixing desks” (Burn 2003b:23) are ready for action. Most importantly, the task must be simple and achievable with clear parameters; parameters which can and indeed should be stretched, preferably at their own pace and with some kind of accompanying rationale. If left to their own devices what results is a form of anarchic, playful mash-up as exemplified in max_mashup.mov. This is great fun and it could be argued that children should be given the latitude to experiment, play and map the possible in this way, as one might brainstorm a topic and then follow up with a more focused exercise. In an opportunistic moment when all the children were ‘on task’, I film them whilst editing and believe that the film demonstrates Csikszentmihalyi’s autonomous “flow” and Vygotsky’s “zone of proximal development” in action. Daniel: You can … if you press these buttons, look, you can like, do the back, or pass it. If you want to change anything, you just like, you just gotta do that … cos look … if you make a mistake you can just take it out from the video. Daniel: So, if you, if you make a mistake you can just go back, and just delete it and when you’ve deleted it, you can just watch your film over and then you’ve got a film with no more mistakes. He talks to me with all the unselfconscious candour and enthusiasm of new discovery and in ways which perfectly rehearse Loveless’s “clusters of purposeful activity” referenced earlier. His preoccupation with correcting mistakes is an indication that they are a regular feature in his school world. Int: Brilliant! Can I see it from the top? … Have you put your “Good Night Mr. Tom pictures in? Int: Fantastic! How did you do that? Int: Yeah, how did you put them in? 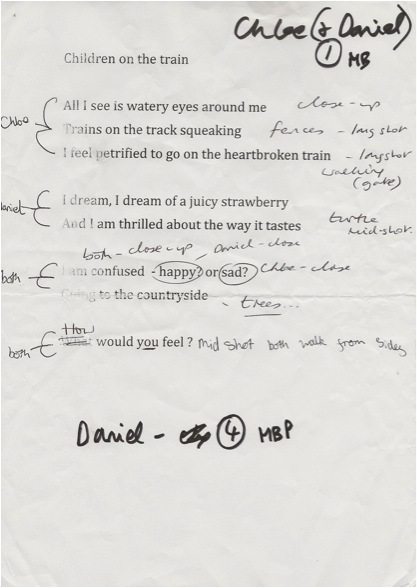 Daniel consistently uses the first person plural indicating his appreciation of the group effort even though this is his own film. With more fluency in his delivery now that he can physically demonstrate it – he shows me how to drag photos into the project, select the appropriate music and record a voice-over. He has rediscovered the pleasures of matching, sifting and sorting that should ideally characterise infant play. Even Taylor next to him, has stopped to listen and watch. See above stelizabeth_film_project_editing.mov @ 5:05 mins. At 5:56 mins,Chloe signals her intentions. She has considered how best to proceed and revises her written poem on the basis of how her digital composition is progressing. In the normal course of a lesson I am told that Chloe is mouse-like and hardly speaks and when she does, you can barely hear her. In this context she finds a clear, decisive and commanding voice, sending her ordinarily more assertive “assistant” off to get her a pen. She also has plans for the sound: “It’s gonna be all over that bit, but the rest that don’t fit in, I’m just gonna cut if off” with a confident waft of the hand. Csikszentmihalyi’s theory that the state of ‘flow’ makes the activity worth doing for its own sake without any explicit end-purpose is particularly resonant here and further reinforces the ways in which media production can enhance engagement. See the relation between flow and “instrinsic motivation”. Lara then records Chloe’s finished film on the screen, introducing it in the manner of a TV presenter. The amount of self-directed learning, as opposed to compliant, is striking and I am left wondering how much more these ‘under-performing’ primary school children could independently achieve with recursive access to mobile, digital technologies. From the audio we hear Tyler is already conceiving of his next project in relation to genre and audience; he feels the need to redress the emotional balance from sad non-fiction to “comedy fiction”: see below steliz_interview.mp3 @ 06:25 mins. With more time I would have developed the issues they introduce around the plausibility of fiction and the veracity of non-fiction, the imagination and written narratives compared with the imagination and moving image. See above steliz_interview.mp3 @ 03.30 mins & @ 06:00 mins; arguments and debates on which they appear to have strong views. When I started working at SEPS it was with ‘gifted and talented’ children; my ICT-related skills were earmarked to cater for the higher order thinking of more able children. This may well be a legitimate expenditure of school funds, however, my personal interest lies with the less able children and my conviction that digital processes can to some extent stimulate their heretofore dormant gifts and talents. Bob understands that cinematic representation is not all about overt showing and literal telling. Recalling Bergala’s hiding/revealing theme, it’s about the thoughtful and tightly wrought crafting of a scene. With ‘film-maker as manipulator’ in mind, I attended the 2010 LATE (London Association for Teachers of English)/BFI Conference on ‘Re-framing Poetry’, where Michael Rosen presented the case for the learning that can come from Performing a Poem and filming it with simple gestures. I took this a step further and had a small group of SEPS Year 6 children with low literacy skills editing their own performed poems with I-Movie. The children had been studying the World War 2 Evacuation and had written a short poem from the evacuee’s point of view. We had sourced photographs, found web movie footage and most groups had produced a shot list from which they created a moving image representation of their poem. We discussed camera distance and the use of visual metaphors to express certain concepts and emotions. 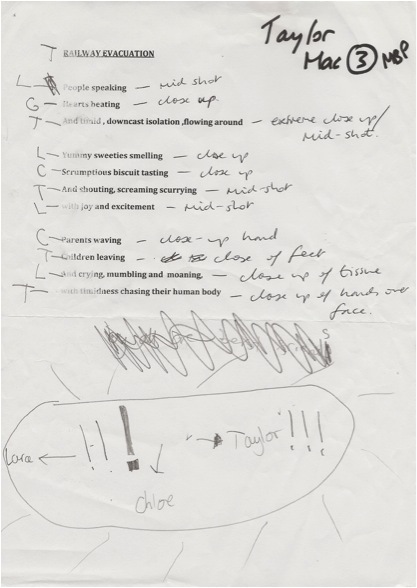 For example, Taylor came up with a close-up of hands fumbling a tissue for sadness and receding footsteps for saying good-bye. Chloe, Elijah and Tyler’s filmed poems, accessible here, are good examples of what can be achieved with traditional literacy input and some technical guidance, but mainly with these children’s existing understanding of the medium of film and their capacity to be social and supportive.